When I first heard about Kat Bastion’s intention to publish a book of poetry, and donate the money from any sales to charity I knew I wanted to be a part of her endeavor. I’ve loved poetry for as long as I can remember, and I thought the poems I read when Kat posted some of hers were amazing. When she and I discussed how Bookish Temptations could be involved I was thrilled when she gave me the honor of revealing who the foreword author to Utterly Loved would be. Thank you, Tamie and Bookish Temptations for joining me in announcing to the world that NYT & USA Bestselling Author, Sylvain Reynard, has generously written the foreword for Utterly Loved. It was by design that I asked you to share in revealing this thrilling news. You, your blog and your friends surrounded me, not only with massive support from some of my early blog posts, including re-blogging and raving about my first poem ever written, Heaven…Found, but also with a love for Sylvain Reynard and his books. All of it played a role in the journey of Utterly Loved. You invited me to describe what led me to ask Sylvain Reynard to be the foreword author. Perhaps a chronological summary of the pertinent events as they played out would tell the story best. In August, 2012, in the middle of editing my paranormal romance manuscript, the perfect storm began to coalesce around me. I had made a promise to myself not to read a single book until the holidays. My self-imposed manuscript deadline had reason and purpose in my driven mind. Those were my rules. I’ve always chafed at rules. In my manuscript’s story, the heroine travels a road of self-discovery after having been plucked off her carefully-crafted path and thrown into an unfamiliar world. Inner strength guides her to do the right thing, no matter the cost. A true transformation begins when she realizes it’s not what she’s fighting for that matters… it’s who. She becomes a warrior. I have become my heroine. What took me off my path? Sylvain Reynard. Over the last few months, I’ve made friends on Twitter with conversations sparked by their love for stilettos, which was due to their love for a Professor with a love for stilettos, who was created by Sylvain Reynard. Their passion for an author I knew nothing about had me pay closer attention to my timeline regarding Sylvain Reynard. With his welcoming demeanor and “Today’s Charity” promotions, Sylvain Reynard struck a different chord with me than other authors. The note was something my ears had been straining to find for over a year. To me, his message was clear: Authorship was an ideal platform to help others. As someone who’d been soul-searching to find a way to be more selfless, I’d discovered a way to help those in need once I “made it” as an author. A sleeping cat inside me had begun to stretch. Sylvain Reynard began posting poetry on Twitter and on blog posts. The world around me vanished as I read Robert Frost for the first time. Where had I been? A match had been struck. Can you feel it when your world shifts? Does the oxygen leave the room? Do you gasp for air not realizing you’d held it? Poems had never affected me before. Something had happened to me. I felt different in my own skin, but I couldn’t explain it and didn’t understand it. An enormous glacier holding back clues to my identity and my real purpose in life had begun to thaw. When you stand there on the glacier looking in, you see the melt from the top down. You can even see what valleys it carved in the past. What you can’t yet see is what the wall of ice holds inside, waiting to be revealed… until it does. In early September, 2012, a poem flowed from those icy depths, surfacing as if it had been waiting there for its time in the world all along, entitled Heaven…Found. Then another floated forth, The Fall. A third one, Blame It On The Moon, followed on the heels of the glowing reviews. In late September, another part of that perfect storm moved into place to affect the glacier on another front. I began to read Sylvain Reynard’s Gabriel’s Inferno. Many friends on Twitter surrounded me with excitement as I read Gabriel’s Inferno, instantly my new favorite book for its unique love story, masterful writing, and underlying themes. Even Sylvain Reynard chimed in, his passion for Dante and the themes of hope, love, and redemption shining through. Around the same time, I decided to surprise my husband with a gift for our anniversary. My poems thus far had been inspired by our memories and feelings. Why not gift him with a collection from my heart? Twenty poems for twenty years. Eleven days later, days after finishing Sylvain Reynard’s Gabriel’s Rapture, thoughts about selfless acts of love ricocheted in my brain. Gabriel’s actions resonated in me. Sylvain Reynard’s cumulative actions finally hit my heart hard. The stretching cat within me fully awoke. All the oxygen left the room again. While I reveled in the love that I have with my husband, and spun poetry to share it with the one man in this world who has given me his heart, I realized that others in this world suffer so greatly, many have never known love. I wanted them to feel… Utterly Loved. On October 15th, 2012 I posted this on Twitter in three separate posts that I saved in my favorites: “Hello, my friends! I… have had an epiphany about blessings and giving. Charity. How a small flame ignites a wildfire. True selfless love. Stay tuned and follow my blog www.talktotheshoe.com for unfolding details about my plans to give before I ever make my first writing dollar. And if you all don’t yet, follow @sylvainreynard. A wonderful example of spreading good fortune through charity in writing and deed.” As you can see, I realized I didn’t need to “make it” as an author to make a difference. The time had come. Clearly I had been waiting for that perfect storm. I’d been gifted a talent I hadn’t ever expected. Power like that should be shared with the world. Why did I ask Sylvain Reynard to write the foreword to Utterly Loved? The answer is quite simple. Without the shining example of humanitarianism that Sylvain Reynard is to this world, I’m very certain there never would have been an Utterly Loved. There had never been another author in my mind worthy to write that foreword. I’m honored and humbled that he agreed without hesitation to do so. With the immeasurably generous heart that Sylvain Reynard has, he even thanked me for asking him to participate. Thank you again, SR, for inspiring me in so many ways, as an author, a poet, a person, a friend, and a humanitarian. If you sought to increase awareness in others to give to charities, you succeeded immensely. I hope we continue to reach others to do the same. My dream is that generosity around the world multiplies a thousand fold. Thank you again, Tamie and Bookish Temptations, for all the support you have shown. It was due to the overwhelming response to my initial poems that I kept writing them. I’m very grateful for everything, including your help in sharing this exciting news with your followers. I hope everyone reading this is inspired to join the cause. 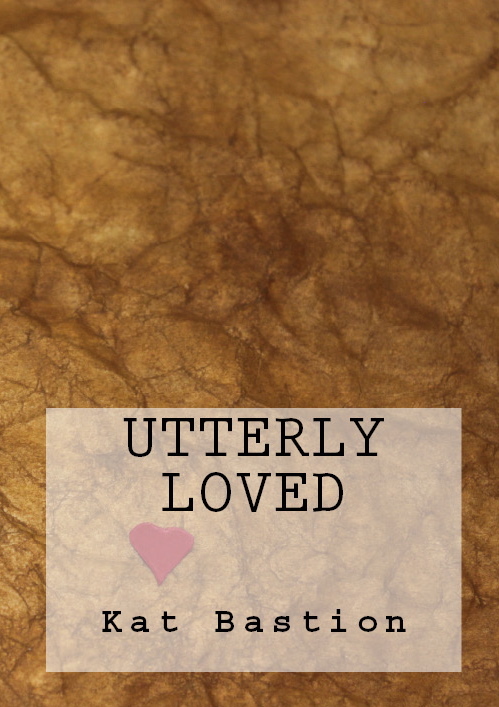 Utterly Loved is a book of romantic poetry being shared with the world for charity. It releases the first week in December. No dollar will ever line my pocket. All proceeds, less costs and taxes, will be donated to selected charities. So far, I’ve chosen World Vision and Covenant House. Please tell all your social worlds and everyone you know about Utterly Loved. Buy two copies. Buy twenty. Standing together around the world we each can do a small part to have a big impact. United we can help those who desperately need it to feel… Utterly Loved. About the Author: Kat Bastion is a multi-award winning paranormal romance writer, poetic warrior, and eternal optimist who loves getting lost in the beauty of nature. Thanks Kat and SR. Two of my favorite peeps in the same post equals a fabulous day don’t you think?!? We’ll be reviewing Kat’s book of poetry, and we can’t wait for the you guys to be able to read it as well. This entry was posted in Author News, Book Release, Books, Favorite Authors, Sylvain Reynard and tagged Foreword author reveal, Kat Bastion, Sylvain Reynard, Utterly Loved. A beautiful post from a beautiful author and person. I’m looking forward to purchasing Kat’s book and delighting in her poems for years to come. I’m not at all surprised that SR would readily agree to write the forward for Kat. He continues to inspire us all with his generosity and kindness. I absolutely agree with everything Serendipitous said. Beautiful post, Kat. Thank you for this wonderful cause. I’m looking forward to purchasing Utterly Loved. And thank you, SR, for always inspiring us. What a fantastic idea! I will purchase for sure because of the charitable purpose, Sylvain Reynard being involved, and I can’t wait to see what you wrote! Thank you, my friends. I am looking forward to sharing Utterly Loved with the world and helping in as big a way as we can. Your support is tremendously appreciate. Loved this Kat & an amazing, inspiring way to go. Thank you, Peejay. I hope Utterly Loved continues to be amazing and inspires love and charity in everyone. I hope you enjoy the book. This is an inspiring post! Thank You for sharing it. I will repost, as it is a great cause. I too had my life changed in ways I am still trying to grasp after reading and rereading SR’s Lovely Love Stories! Gabriel has been a top “boyfriend” for a long time!!!!! I will be anxious to read Kat’s poetry! I plan to share it with others for the good cause! Thank you, Clsita. I’m glad you enjoyed the post and thank you for the repost! Thank you for buying Utterly Loved and sharing with others. Your generous heart is greatly appreciated.